When it comes to ramen in Kyoto, you have many choices, but not many of them as authentic as Garam Masala. This restaurant began in 1983 when it was run by the present owner’s mother. So for over 30 years, the restaurant has been serving the people of Kyoto spicy curry. And spicy it is. Their curry is not the mild one many other restaurants in Japan serve – although they, of course, have mild curries like butter chicken too – their curry really packs a punch. The restaurant is not too far from the popular Shisen-do Temple, so you could make a trip to both Shisen-do and Garam Masala on the same day. Inside the restaurant the interior is almost completely made of wood, making for a very warm and welcoming atmosphere. This keema curry is what this restaurant is currently the most famous for, and the taste of it has depth. The spices all just seem to work, and the egg is a nice addition. You should first have the curry without breaking the egg, and then enjoy it again after you’ve broken the egg, and let the yolk out. The yolk helps mellow the taste down a bit. You can choose to have naan or turmeric rice with your curry. For lunch, Garam Masala lets you try many of their curries at once. For 1,300 yen you get to try three of their curries, and you also get Indian salad (sabji) with it, plus rice and naan. The tandoori chicken here is made in an authentic tandoori oven, and you can taste it. The taste is pretty much just the way it should be; delicious. And you also get some vegetables that have been cooked with the chicken, so this dish is not only delicious but also healthy. What’s the best souvenir to buy in Kyoto? Yatsuhashi cookies of course. And Garam Masala has teamed up with an old and renowned yatsuhashi-maker to make Garam Masala’s famous chai into yatsuhashi. 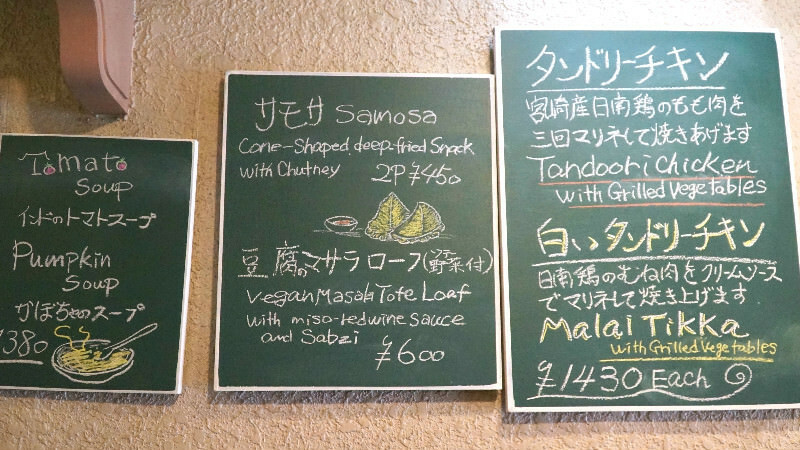 If you look at the blackboard downstairs you can see the names of some of the dishes in English. If the first floor is full, they also have tables on the second floor. Don’t forget that they also have desserts. This restaurant is run by a Japanese woman, and it was started by her mother. The restaurant offers uniquely authentic Indian food for Kyoto, and the taste is spicy and satisfying. After tasting the curry here, you’ll know why this restaurant has been in business for well over 30 years. This curry restaurant was founded over 30 years ago, which is why many people think of it when they talk about curry restaurants in Kyoto. The food is all good, and you can taste the dedication of the owner in each and every one of them. Personally, I really liked how the souvenirs (Kyoto-style crackers and cookies) went well with beer. Ichijoji as an area is famous for ramen, but if you want to try something I bit different, I recommend you have curry in Ichijoji. A 12-minute walk from Ichijoji Station or take Kyoto City Bus #5 from Kyoto Station and get off at Ichijoji Kinomotocho bus stop. Thursdays, except on national holidays. They sometimes hold live music events on the weekends. They may not speak much English, but the restaurant is very welcoming for all. Japanese only, but they’re currently in the process of translating their menu into English.